While Sky is satellite only, Freeview is both satellite and terrestrial. Freeview uses the same satellite as Sky, so only one rooftop dish is needed. However, at the moment only the terrestrial Freeview signal is HD (Sky is HD). There have been plenty of ads running nationally, including some from Sky reassuring its viewers that they’re already digital. Freeview has been running ads with the slogan, “To Be Fair, It’s Got To Be Free”, which is, of course, very true (not everyone can afford pay TV, after all). But the government has also been running ads and an information campaign though Going Digital. Clearly, it has worked. The rest of the South Island will go digital on April 28 of next year, the Lower North Island (and rest of the East Coast of the North Island) on September 29—exactly one year from now—and the Upper North Island will be the last on December 1, 2013 (see map, above; click to embiggen). I’ve now told you more useable information than the Herald online article did, and this is one of my main complaints with their website: They almost never link to other websites, even when, as in this case, doing so could provide readers with much-needed information. In my view, that’s indefensible. One of the Herald’s prominent columnists recently called bloggers “parasites” for daring to comment on the work and stories of journalists. It was met with derision and mockery by bloggers who almost always link to whatever they’re talking about—driving eyes to mainstream media websites. Many journalists cheered that columnist’s childish rant (which I’m NOT linking to on principle; search for “blogger parasites” and you can find it if you really must). For the Herald to refuse to link to outside sites, even when there’s a clear public need for them to do so, is just petty and stupid—and a huge disservice to their readers. In Internet-speak, that’s known as a #FAIL. So there you have it: A blog post with real information, links to original sources for more information AND commentary all together in one place. That’s what the digital age is supposed to offer; one day, the Herald may catch up and see the dawn, too—if they’re around long enough. No parasites were harmed in the creation of this post. 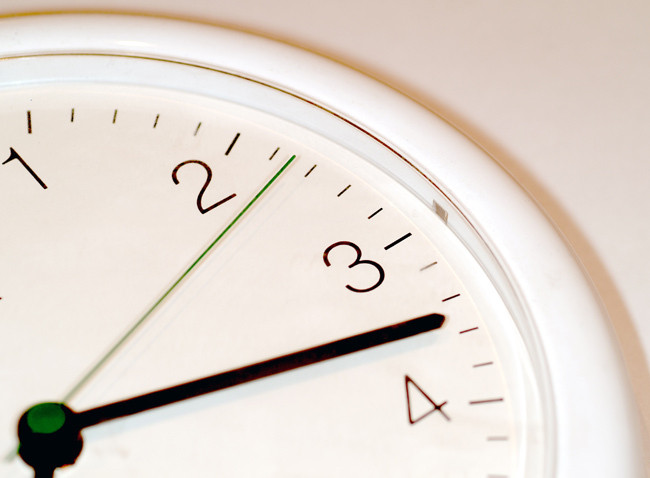 Tonight we turn our clock ahead one hour—we spring ahead. I think I’m one of the few people in the world who doesn’t care about daylight saving time—apart from the fact the word “saving” is singular, not plural (or possessive, either), so there’s no “s”. Seriously, though, I just take the time change in my stride. When I was younger, I used to like the autumn change because I got “an extra hour of sleep”. Of course I could get an extra hour just by sleeping an hour later, but that one night a year it was like I got a “free” hour—I got the extra hour but could get up at the same time. The spring change was maybe a little harder, but not terribly (unless I was up late on the Saturday night). I didn’t have trouble adjusting in spring either. I think I’m not very typical in this (as with SO many other things in life…). My dad used to complain about people arriving an hour late or early (depending on the time of year) for Sunday services on the mornings after a time change, but I doubt it was ever many people. Still, many people do seem to be bothered by the time changes, and we’re all inconvenienced to some extent. For example, depending on the time of year New Zealand is either 16, 17 or 18 hours ahead of the Eastern time zone in the USA; this makes it difficult or annoying when I try to arrange times to meet up online with friends or family back in the US. I think it the clock changes should end—I can’t see any sense in it anymore. Countries change their clocks on different dates, or not at all, and there are variations within countries (like the USA and Australia); we’ve created a global time zone mess. If we abolish daylight saving time, then we’ll have gone a long way toward cleaning up this mess. And, there’ll also be one less thing for people to complain about. Yesterday evening, I saw a Tweet from a rightwing religious group helping to lead opposition to marriage equality in New Zealand. They were gloating that, as they claimed, “Support for Gay Marriage Drops In Latest Poll”. Except, that was all just spin and wishful thinking. In July 2011, Research New Zealand released a poll that found that 62% supported marriage equality in New Zealand, 34% opposed it, 2% said there was “little or no difference between civil unions and marriage” and 2% said they didn’t know. In the new poll, released last Friday, 49% support marriage equality, 32% oppose it, 15% said they “did not mind one way or the other” and “Don’t Know” was 3%. Here’s what you need to know about this new poll: Nothing’s actually changed. In 2011, they didn’t offer people the choice (or didn’t report the answer) of not minding either way, so we can’t make any realistic comparison between support in 2011 and 2012. However, since opposition dropped slightly in 2012, we can infer* that many of the people listed as supporting marriage equality in 2011 haven’t become more opposed to it; instead, it's clear that they’re definitely NOT opposed, but truly don’t care. What the 2012 poll probably actually shows is the true level of firm support and firm opposition, with a sizeable chunk—that 15%—simply genuinely not caring either way. We can say that because if those people were moving toward opposition (as that same rightwing group seemed to be implying in a Tweet to me this morning), then they most likely would have gone to “don’t know”. Also, actual opposition dropped, with soft opposition moving to “don’t know” or the new don’t care either way position. If the rightwing group was correct, we should have seen opposition grow, not reduce. The fact is, this new category is a very Kiwi attitude: Many New Zealanders just don’t get worked up about things that don’t affect them. In such situations, Kiwis may shrug their shoulders and say they “don’t mind one way or the other.” They’re far too busy with their lives to get drawn into heated battles that don’t affect them personally. So, what the poll shows is that outright opposition is down slightly, but, more importantly, those who support it or don’t care—remember, that 15% doesn’t oppose it—is actually higher than it was last year and outnumbers actual opponents by a 2 to 1 margin. That rightwing religious group was being deceptive and disingenuous by seizing only on the one number—those who said they support marriage equality—in isolation from all the other numbers. The poll, taken in its entirety, actually shows that attitudes are pretty much the same as they were a year ago. Also, Radio New Zealand’s Afternoon programme with Jim Mora discussed the survey on Part 2 of their “The Panel” segment on Monday, September 24. The panel featured Mora, Karl du Fresne and Barry Corbett, who were joined by Emanuel Kalafatelis, Director of Research New Zealand. The topic starts about 17 minutes in (though the topic before it is related). This post is a revised and expanded version of what I originally published. Update 29 September: In May 2012—10 months after the first Research New Zealand Poll, and four months before the current one—a ONE News Colmar Brunton Poll was conducted and found that 63% of New Zealanders back marriage equality and only 31% opposed it [Download the PDF]. The poll also had a much larger sample size than the RNZ polls, and has a smaller margin of error. This poll further reinforces my contention that support for marriage equality in New Zealand has remained stable, despite claims to the contrary. 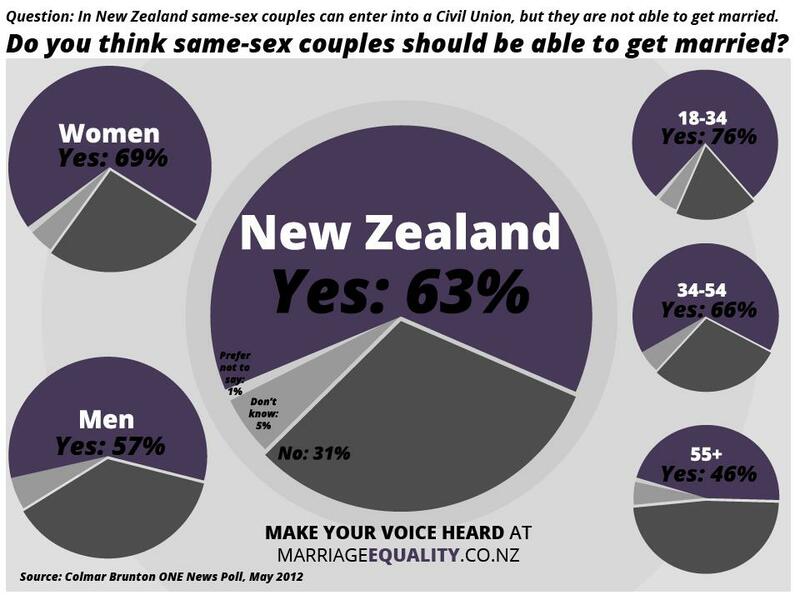 The chart is from Marriage Equality NZ [click to embiggen] and shows some of the results of the ONE News Colmar Brunton Poll. *Update 2: In further Twitter exchanges, the rightwing religious group took exception to my use of certain words: "When blogs say 'infer' and 'probably show' you know they're on shaky ground". They would say that: They always attack facts and reason to divert attention from their attempts to mislead. So, when I said, "we can infer", it was just another way of saying "it's bloody obvious", because it is. The word "probably" in the next paragraph was poor word choice, so I've added strike-through and changed it to "actually", because that's obviously the correct word. This is the brand-new video in support of marriage equality in New Zealand, released this evening by the Campaign For Marriage Equality. Among other things, the group is encouraging people to make submissions to the Select Committee, and is raising money to help spread the word. So, be sure to share the video. Folks on Facebook can go and “Like” their Facebook Page (silly as it may sound, this actually does help). I’m sure we’ll all being hearing a lot more from them in the weeks ahead. Today I had an collision of two issues that are connected by a single question: Who tells our stories? One is overtly political, the other has politics imposed on it, and both are, in essence, about the invisibility of GLBT people in much public discourse. The main complaint seemed to be that heterosexuals, who perpetrate oppression against LGBT people, are by definition “privileged”, and so, should not presume to tell the stories of oppression of GLBT people. Inventing an upside-down world, even if to help heterosexuals understand oppression of LGBT people, is merely perpetuating that oppression (evidence for which is that doing an Internet search for the underlying theme yields all sorts of vile, hate-filled sites). Instead, the post authors argued, the stories must be told by actual gay people, the “gays in front” model. Related to this was a video posted over on Joe.My.God. It apparently commented on the fact that gays are missing from pro-marriage equality ads this year. However, the user deleted the video (the post may go, too), so I don’t know for sure what was in it. Nevertheless, the comments to Joe’s post raised important questions about whether real gay couples should be depicted in such ads. My own view is: Sometimes. Many of the comments support the belief that one of the factors that led to our defeat on Proposition 8 in California was that the campaign on our side made a conscious decision not to use gay people in any of their ads, meaning the issues weren’t “humanised”. While this belief has widespread support, I’m not aware of any critical academic research that supports it. Still, it makes a certain amount of common sense: If an issue is affecting real people, then those real people ought to be seen in the campaign. The reality, I believe, is far more complicated. Today was the New Zealand ShakeOut, a national earthquake drill. At 9:29am, we were to drop, cover and hold. 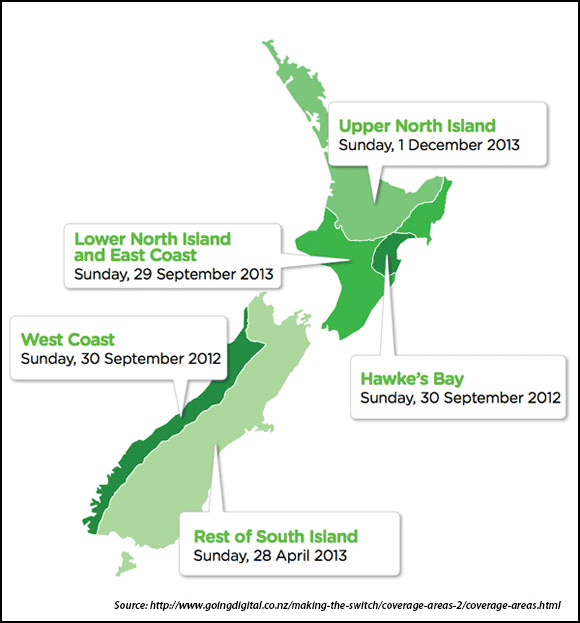 Around 1.3 million Kiwis took part. We took part at home, which confused the dogs, but which was otherwise fine. There are several things that I thought worked well: A couple minutes before the start, Civil Defence Tweeted to get ready. 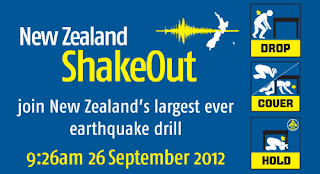 At 9:29am, the radio station NewstalkZB and TVNZ’s TV One both played the Civil Defence emergency sound (for a few seconds). And—that was it. Here’s what could have been better: A status update on Facebook, either like Twitter or as it began. Last week, Auckland Civil Defence launched an iPhone App that, among other things, can transmit emergency warnings. It was silent, missing a great opportunity to test the system in real life. Use of social media as if a real emergency was happening: They would probably need a disclaimer, but they should send out emergency notices as if the threat was real. Also, they should activate emergency alert on the phone app (hopefully they’ll have an Android version by then, too). They really need to test it as if there was a large-scale emergency because we don’t want it failing if there ever is one. Pick a better date. This year, the event was at 9:26am on September 26—9:26, 9/26, which would be catchy were it not for one thing: New Zealand writes its dates the other way around (26 September, not September 26; weirdly, 26/9 is the 269th day of the year…). So, they had to resort to the convoluted “ 9:26-26:9”. I think they should pick something easier to remember, like 10:10am on October 10) 10:10 on 10/10. I may be in the minority on that one, though. Still, the effort raised awareness, which is always a good thing. So I think it was a good first effort, but we have to keep awareness going. The “Get Ready, Get Thru” site has great resources to help people prepare. And, yes, I did feel a little silly crawling under my desk at 9:26am. This is the weirdest American political campaign year that I’ve ever seen—and by now I’ve seen a few. There’s so much to comment on, and so little time, so here a few stories that caught my eye this week. Republicans have been busy enacting state laws to make it harder for people to vote. They claimed they were doing it to fight election fraud, but there’s one slight problem: They really haven’t actually found any. What isn’t explained is why the vast majority of people that will have a harder time voting this year just happen to be from demographic groups associated with the Democratic Party. Must be a coincidence, right? A study released by the Sunlight Foundation reveals that 78% of the outside spending on this year’s elections is directly attributable to the infamous Citizen United Supreme Court ruling: $272 million comes from Super PACs that only came into being after the ruling, and $93 million comes from corporations, trade associations and non-profits, all groups that can now spend unlimited amounts on campaigns. This is a very bad thing for democracy. Picking up on one of my favourite unanswered questions, Media Matters asks, “When Will The Media Stop Treating FRC Like A Serious Policy Organization?” It remains a mystery why the SPLC-certified anti-gay hate group is treated as if it was a legitimate representative of conservative thought when they’re really just run-of-the-mill bigots. The fact that they’re factually wrong—and deliberately spread falsehoods—ought to make the mainstream media keep the hate group at arm’s length, but that’s not what happens. It all started with a book, and ended up being a lesson in the need for caution—and a bit of extra work—when buying books over the Internet. I’ve said in many different posts how expensive books are in New Zealand, especially compared with prices in the US, with its obviously enormous market compared to New Zealand. This is something that nearly every American expat I’ve spoken with has mentioned. So, I needed a book, the “Classroom in a Book” for Adobe Premiere Pro. I looked at Amazon for the Kindle version because, as I’ve often said, an ebook version of a book dealing with computer software is the most sensible and affordable option; not only are such books usually insanely expensive, they also go out of date quickly—a version change or two later, and they’re not terribly useful. When we had a clean-out last summer, we got rid of a many kilograms of hopelessly outdated computer software books. However, the Kindle version wasn’t available, apparently because of a problem with it, but the paper (“dead tree version”, as I call it), was on special. The same book wasn’t available at the two New Zealand online retailers I’ve used before, Whitcoulls and Fishpond. So, I decided to place a full order with Amazon, one including that book and others. Afterward, I did a price comparison between Amazon, Fishpond and Whitcoulls. This wasn’t entirely easy: In addition to the Adobe book, another item wasn’t available. A couple other items were slightly different (a paperback instead of a hardcover, for example). The NZ suppliers offered free shipping, while Amazon charges—a lot. The difference between the slow boat shipping (14-30 days shipping time) and reasonable shipping time (7-10 days) was less than US$20, so I chose faster. As it happens, the package arrived almost exactly four days after I placed the order, which is slightly better service than I got from Fishpond, but dramatically better than I got from Whitcoulls, which took an astounding14 business days—the better part of three weeks (the book shipped from Australia). Everything has a cost, however. Add in the shipping charges and the picture changes: Fishpond would have been about $4.37 cheaper for the same order, though Withcoulls would have been about $21.25 MORE expensive. This is all academic, of course, because I wouldn’t have bought those books online anywhere if I hadn’t been after a book I couldn’t get any other way. And, it makes sense to place a larger Amazon order rather than a smaller one, due to those shipping charges, which don’t escalate dramatically when you order more. The lesson in all this is that sometimes books are actually cheaper through NZ-based suppliers than they are from Amazon, which may come as a surprise to some American expats, I’m sure. However, the only way to know is to compare prices, something many people don’t want to take the time to do. 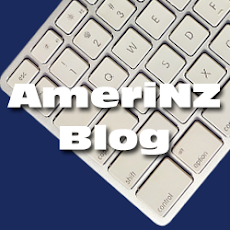 My own advice is to first check for NZ-based suppliers, and if that item isn’t available in New Zealand, or if the cost is dramatically higher here, it may make sense to order from overseas. It’s also worth noting in this context that just because the supplier is NZ-based doesn’t mean the book won’t actually come from overseas, too. So, I was very pleased with the service I got from Amazon and with the prices of the merchandise. However, the shipping prices are so high that in future I’ll check very carefully before placing an order. It wouldn’t have mattered this time, but in the future it might. And one final twist: Having looked at the book that started all this, I was better off buying the “dead tree version”, after all: It comes with a DVD with the lessons and other files to help users learn the software. I'm listening to music as I proofread an essay. A song comes on. I remember listening to it in my parents' house, and then I think of how much I miss them and wish they were still alive. And I resolve, yet again, to never miss an opportunity to tell the people I love how much they mean to me. One day, the chances to speak up will run out and those folks must never think for a second that my love for them has. And then, the song ends. All of that is true and written in the moment, stream of consciousness style, as it happened. My point, of course, was about the importance of connection to the people we love. I ended the piece that way on purpose: The song ends, the moment ends, does the resolve? Do things return to the “we’ll all live forever” normal? It’s up to each of us to decide for ourselves. The essay I mentioned was, not surprisingly, a blog post—what are they if not essays? As I edited, I stopped when I heard the song, and was lost in my own thoughts of nostalgia and longing. And then I put pen to paper, metaphorically speaking, to capture in words what I was thinking and feeling. As I do. But I seldom publish such things on this blog (or anywhere else). Someday I should talk about why that is. Still, a personal blog ought to be about what is in our hearts or, at least, what passes through them. The whole point is to bear witness to life as we see it and feel it, even when it’s a bittersweet remembrance as we do something else. The song always ends. Our connection to those who share our lives with us doesn’t have to. This is a bit of a weird story. On December 25, 2008, I posted a video called “Auckland Christmas” to YouTube, and also to my podcast as “AmeriNZ Video 03 – Auckland Christmas” (and I also posted a verison to this blog as “Auckland Christmas”). The video contained a music track that I used under license from the Podsafe Music Network (now called Mevio Music Alley). At some point after I posted the video, the artist apparently signed up with a licensing agency that charges for use. I was unaware any of that had happened—who keeps running checks on tracks they’ve used? Here’s where it get’s really weird: The track is still listed and available on Mevio’s Music Alley—so, therefore, my original license must still be valid. If it’s not, then the burden of proof ought to be on the company claiming licensing rights, and they shouldn’t get free ads at my expense. However, I’m not a copyright lawyer and can’t afford one, so I can’t comment on any of the legalities here. Instead, this is only about my sense of right and wrong: I legally used a track provided for my use and I fully complied with the terms of the license I was given. That license appears to still be in effect. I think—but don’t know—that the copyright licenser didn’t take any further action because I complied with the terms of the license I’d been given (and which may still be in effect). However, I’m in no position to challenge them or Google/YouTube. So I was left with few options. First, the new company licenses tracks for $1.99 and I could have paid their fee to re-license the track from them, but why should I? As far as I’m concerned, I already had—and still have—a valid license to use the track. The second option is the nuclear option: Deleting the video from YouTube (which is a shame because it was the most viewed one I had). This is the option I chose (though I first made it unlisted while I decided what to do). My next step was to take the original video project and delete the music track entirely, along with any mention of it in the end credits and written descriptions. I left the end of the video silent as a sort of protest. I then overwrote the copy on my podcast site so the video’s still available. My final step will be to upload the altered/censored video back to YouTube. Had I paid to re-license the track I already have a license for, I’m sure I’d have to alter the credits in the video and re-upload, anyway, so why not instead make a point? I chose that track originally because it was free and reasonably inoffensive, meaning, innocuous. It wasn’t overtly religious, as so many Christmas songs are, and wasn’t awful (as, frankly, so much free music is). There was no option to pay anything for the music and, four years ago, there were few if any other options for music I could use legally. So there you have it. Some company asserts its muscularity and someone like me has little choice but to surrender—or fight and face the consequences. This song is not worth the fight, even if the principle could be. But since I clearly have no idea what the law says about a situation like this—someone legally uses a music track they’re licensed to use, then later someone else claims the rights—this case is too murky to take a stand on. Next time, it may be different. 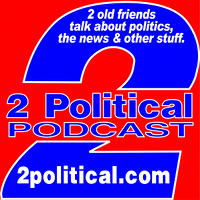 This is crossposted to my podcast site, one of the few times I’ve done that. This ad is for Bridget Mary McCormack, a candidate for Michigan State Supreme Court. What makes this ad so great is that it features a reunion of the cast of The West Wing, one of my all-time favourite TV shows. The point of the ad is get voters to pay attention to the non-partisan portion of the ballot, something that many voters skip over. In addition to voter education, the ad also makes it clear who they should vote for. Neither the ad nor the campaign are about partisanship or party politics, which is proper. This is the most innovative advertising approach I’ve ever seen for voter education as well as non-partisan campaigning. It is absolutely brilliant. There’s also a non-candidate PSA version of the ad, which includes a little more with Lily Tomlin and Martin Sheen , and shortens the scene in CJ's office. What I liked about The West Wing is that it didn’t treat its audience like they were morons, and instead assumed that even complex or arcane subjects of law, history or politics could be explained and understood. This ad does the same thing (with some good-humoured jabs at the show). Judicial candidate Bridget Mary McCormack is the sister of actress Mary McCormack, who played Deputy National Security Adviser Kate Harper in 48 episodes of The West Wing 2004-2006. We need more ads that can be entertaining and informative all at the same time. But this ad also kinda makes me wish I lived in Michigan so I could vote for Bridget Mary McCormack on the non-partisan ballot! Two online ads caught my eye as further examples of ways to use humour to make a point. The ad above is from the Obama campaign and pokes fun at Mitt Romney’s habit of taking the president’s words out of context. Romney does this all the time, of course, which is odd considering how easy it is to debunk him. So, this ad shows what it would be like if the Obama campaign did to Romney what his campaign does to President Obama. I think it’s funny and effective. The ad below—with NSFW language—is about the voter I.D. laws enacted by Republican state legislators to suppress Democratic votes. I think this ad is funny, too, though it’s obviously more strident than the Obama ad. The core in both ads is humour, and humour takes many forms and comes in different strengths. I think that, too, is a good thing. It’s been a rough week, for a lot of reasons, and I’m plain worn out. Blog posts just wouldn't let themselves be written today. So, a cat photo as a temporary antidote. 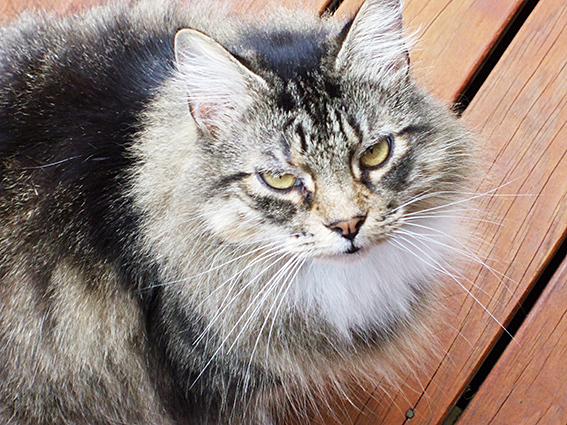 Pictured is our cat, Bella (who doesn’t get shown on this blog nearly enough…), last year. I’ll resume normally scheduled programming tomorrow. Opponents of marriage equality often base at least part of their opposition on their belief that homosexuality is a choice. One of their New Zealand leaders claimed it had to be a choice because the Human Genome Project mapped the human genome and didn’t find a “gay gene”. The thing is, they weren’t looking for one. On April 14, 2003, the Human Genome Project announced they had completed mapping the human genome—but mapping it is nowhere near the same thing as understanding it. In fact, it will take decades—or even centuries—before we work all that out—what genes do, how they work with each other, and so on. The mapping project is kind of like this: Imagine walking into a huge library, row upon row of shelves, filled floor to ceiling with thousands of books, each one wrapped in blank paper. You set about numbering the books and writing down where they are (which row, which bookshelf, etc) and compiling an index so you know where that book is. However, since all the books are wrapped in blank paper, you don’t know what their title is or what’s inside them. THAT is what the Human Genome Project accomplished—the mapping of where those “books” are. Since then—AFTER the genome was mapped—researchers identified some specific genes that do some specific things, like the gene that creates lighter skin colour (identified in 2008), or the gene that causes nearsightedness (identified in 2010). Again, the functions of these genes were found AFTER the human genome was mapped. All of which means that the fact that scientists haven’t found a “gay gene” doesn’t mean one doesn’t exist. Over time, as the function of more genes is identified, we may know whether such a gene exists or not, but we’re a very long way from being able to say either way. Here’s another wrinkle: Even if there is no single “gay gene”, that doesn’t mean sexual orientation isn’t genetic. Think of that library metaphor: Some of those books may contain references to other books; by themselves they may not have all the information, but taken together, they do. In a similar way, a combination of certain genes could be involved in determining human sexuality. So, the rightwing politician was factually wrong and misleading when he said that the Human Genome Project didn’t find a “gay gene”—they weren’t looking for one because it wasn’t their job. The fact is, the preponderance of evidence is that human sexuality has, at the very least, a genetic component, something even that same politician finally admitted. The larger point, however, is this: It doesn’t matter. Religion is 100% choice, and yet we don’t forbid couples of certain religions, or without any religion, from having a civil marriage. Similarly, we don’t forbid couples with certain political views from marrying. So, even if homosexuality really was a mere “choice”, that fact alone would NOT be a logical reason for denying civil marriage to same-gender couples. So, why or how some people turn out to be gay or straight may be an interesting thing for scientists to research, but it has no relevance in determining whether same-gender couples should be allowed to commit to each other in civil marriage the same way that opposite gender couples can. The only choice, the only logical option, is to choose marriage equality. 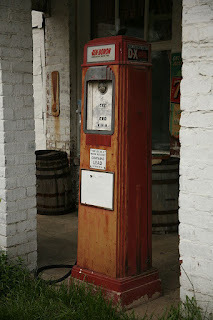 People complain about the price of petrol (“gasoline”). Sometimes they complain a lot. The prices are among the most volatile for products we need on a regular basis, and the price movements—especially upward—seem, from our perspective, so random and unjustified that we tend to take a price hike almost personally. I think that a little perspective is a good thing. Today one of my e-friends mentioned the price of petrol where he lives. Apparently premium is US$4.29 which, he reports, is up nearly 30 US cents in one week. Here in New Zealand, premium unleaded is today retailing for about 7.09 US dollars per US gallon, and regular unleaded is about 6.84 US dollars per US gallon. Similarly, a 30 US cent per US gallon increase in price is just under 10 NZ cents per litre; I can’t remember that big a jump in one week. He asked me how we cope with prices at those levels, and the answer is really just that we always have. Most of the price of petrol in New Zealand is tax, and retailers get around 4 NZ cents per litre in profit, give or take. This obviously affects everything else: The cost of transport is passed along in the prices we pay for food and all other goods, making them higher than they might otherwise be—which is also true of wages, further driving up prices. As in most other Western nations, the wealthy take little notice of all this, and the middle class somehow manages to cope, though most middle class families rely on two incomes to get by. The poor and working poor suffer the most, especially in places with poor public transport (which includes Auckland, but that’s a topic in itself). 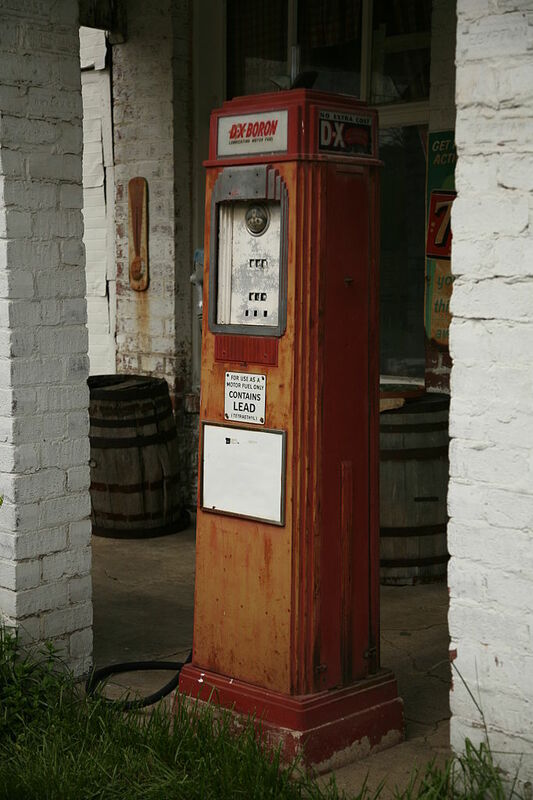 As petrol prices rise—and low wages do not—poor families often have to cut back on other things, like food and clothing, in order to put petrol in the car so they can get to their low-paid jobs. Recently, TV3’s Campbell Live looked at the real-world impact of our current government’s economic policies by looking at the lunches of kids in a classroom in a school in a high-income area as well as in one room in a school in a low-income area. It’s an imperfect examination, of course, because it showed only two rooms—but the reality is indisputable (despite what the current government thinks, poverty is real). The video is online—check it out for yourself (I think, but I’m not certain, that the video is viewable overseas). In the June 2011 Quarter (the most recent I could find online), the median income in New Zealand for those receiving wages and salaries was $800 per week (around $41,600 per year). “Median”, of course, is the point at which half the people receive more and half receive less—the middle point. The median household income in that same period was $1,289 per week (around $67,000 per year), and this is how families get by—two or more incomes in a household. In the time since that quarter, wage growth has been slow and unemployment has remained stubbornly high. On the other hand, inflation has been relatively low, despite fluctuating petrol costs, and interest rates remain low. This is how the middle classes manage to tread water, though the working poor are finding that increasingly hard to do. So the price of petrol, its impact on an economy and people are relative, but the challenges are similar. This is why I think it’s good to keep a little perspective when complaining about petrol prices and so many other things. Here’s a tip: It’s easy to work out petrol price AND currency differences at the same time using Google. To convert NZ prices per litre to US prices per gallon, for example, I’d enter the price of regular unleaded and what I want to know, like this: 2.179 NZD per litre in USD per gallon (NZD is NZ dollar, of course, and USD is US dollar). Going the other way—to convert that premium unleaded price to what we would pay in New Zealand—just reverse the chain: 4.29 USD per gallon in NZD per litre (roughly 1.36756137 New Zealand dollars per litre, btw). This is also how I worked out what the US price increase would be in New Zealand: 30 US cents per gallon in NZD per litre. These calculations are a little rough, and depend partly on how good the exchange rate calculations are, but hey: It’s Google! It’ll be pretty accurate. The photo with this post is by Daniel Schwen, via Wikimedia Commons. Today is Women's Suffrage Day, commemorating the date—September 19, 1893—when New Zealand became the first country in the world to grant women the right to vote. There's so much work yet to be done to ensure equality for women, but it's good to take time to stop and remember successes, and the point at which the real work could begin. 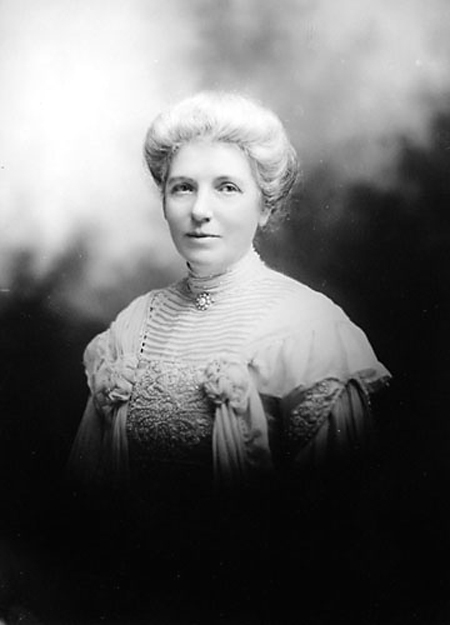 Pictured is Kate Sheppard, a leader of that effort and a heroine for the cause. Yesterday I logged on to Facebook, in part, to see if there were any new posts from a high school friend, Hector. He’d attended our class’ 35th reunion last weekend, so I was curious if he’d posted anything about it—or about anything else, because he always posted interesting things. But instead of interesting or entertaining posts, I read on my class’ Facebook page that Hector had died suddenly on the way back home. To say I was stunned is a bit of an understatement; I was already a little emotionally deflated after the Pride 48 podcasting weekend, so reading that knocked the wind out of me. I’d only reconnected with Hector in October of last year, on Facebook; I hadn’t spoken with him since high school. We’d been casual friends back then, enough to have a friendly chat (or more serious discussion of the issues of the day), and I always thought he was intelligent, thoughtful and had a good sense of humour. However, Hector and I weren’t in the same group of friends, and in a way that only makes sense when one is a teenager, I was wary of some of the folks in his friendship circles. So, it wasn’t surprising that our connection ended after we graduated. Recently, however, I’ve been interacting with a wider variety of people on Facebook, including some of my high school classmates, and through someone else I ran across Hector and sent a friend request. Before long, we were commenting on and/or sharing each other’s posts, and getting to know each other, probably for the first time in some ways. Now, that’s all over. I’m pleased for him that he had one last chance to get together with some of his family and friends, and glad for them, too, that they got that chance as well. Many people never get that opportunity. And yet, I can’t help thinking about some of the symbolism around Hector’s death. When a classmate dies, especially someone we all thought highly of, and who was still full of life, we can’t reasonably persist in the self-delusion that we’re not really aging. Times like this remind us of the march of time and of our own mortality. Podcasting is a lot like blogging: The people who love it are really into it. Those who don’t like it tend to really dislike it. That’s okay, different strokes for different folks, and all that. I’m a huge fan of both: I’ve always considered myself a blogger first, which is kind of ironic when you consider that one of my podcast episodes gets downloaded more in one week than my blog gets hits in several weeks. Still, that’s how I see myself, so, I love blogs—writing posts, reading others’ posts and commenting on them (not as much as I should). But I also love podcasting. I love the challenge of producing a recorded programme that others find at least somewhat interesting, and also the challenge of always trying to improve the sound quality. All of that appeals to the creative side of me as well as the geeky side, so it figures I’d love it. Podcasting, especially within the context of Pride 48, provides something special: Community. 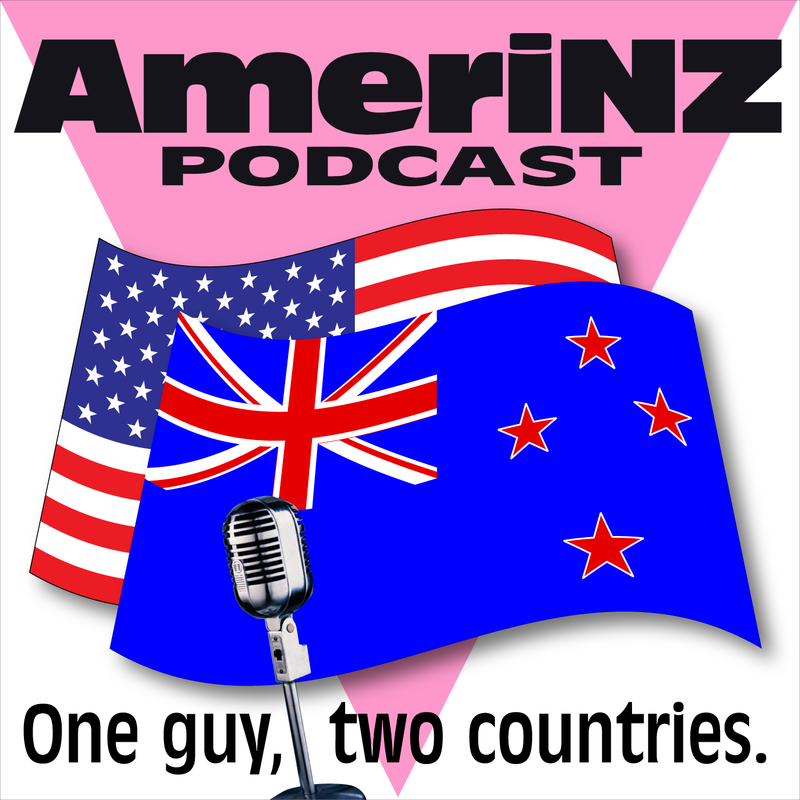 The fact is, were it not for Pride 48, I wouldn’t be part of any podcasting community at all: I’m not aware of any other GLBT podcasts (that are only podcasts) in New Zealand. In fact, there are very few non-commercial (not originating as radio shows or similar) podcasts at all in New Zealand, so mine is kind of doubly unique. Some of the folks in Pride 48 have become my close friends; others are less close, as is the nature of such things, but we all respect one another and support each other in doing what we do. It doesn’t matter if we like each others’ shows—hell, we may not even listen to each other—but as podcasters we know what we all face and we’re supportive of each other. This past weekend was Pride 48’s annual 48-hour (which is where the name comes from) live podcasting extravaganza. That’s why I haven’t posted anything since Thursday—I was too busy with last-minute details (I coordinated the shows that broadcast from outside of Las Vegas). There’s always a tremendous feeling of family that emerges among those who take part in the weekend, whether as podcasters or listeners, and why not? There’s nothing else like it in the world. In the final speeches, there was much said about how Pride 48 is a family. The fact is that independent podcasting, with its emphasis on the human voice and human interaction, provides a connection with the world, and with other LGBT people, that no other medium does as well. Its portable nature—they can be loaded onto any portable music player—makes them ideal for people who lack safety or community—or a welcoming family. In such cases, Pride 48 podcasters can help some people feel less alone and less isolated. That’s a pretty great return on investment, in my opinion. I love blogging. Maybe now you know a little better why I love podcasting, too. Blogging is for me, as for most others, more like a hobby. I don’t get paid by anyone, don’t have any sponsors, and I don’t care about either. I say what I want, even sometimes when I shouldn’t, “without fear or favour”—well, with some favour, obviously. As something like a hobby, however, this blog has sometimes suffered from a lack of attention at times when I get busy, and this has been a very busy year. I have a goal of an average of one blog post per day, though I don’t necessarily publish one every day. Check out the “Blog Archive” column on the righthand sidebar. You’ll see that some months had significantly fewer posts than there were days, others significantly more. Because of the latter, I am, with this post, right on top of my one-per-day average for 2012 (so far). Does any of this matter? Probably only to me. It’s a challenge I set for myself, and I’ve met or exceeded that goal every year so far—including 2006, in which I had only three and a half months of blogging. I would never pretend that all those nearly 2300 posts so far are “good” in any objective sense, but quite a few, in my biased opinion, certainly are. Some are duds, of course; it’s in the nature of these things. So, here I am, six years after starting what was in some ways an experiment, and I’m still here. I’ll keep blogging for as long as it interests me—and, ultimately, I do this to express myself and to talk about the things that interest me at the moment. The “pay” I get is for doing this blog, though, isn’t the self-expression or, at least, not entirely. Instead, I thrive on the interactions I have, here and in other forums. And that’s why I blog: The opportunity to express myself and the rewarding exchange with others. Even after six years, they both still matter to me. Yesterday afternoon, I emailed off my FPCA (Federal Post Card Application), which all US citizens living overseas (temporarily or indefinitely, military or civilian) are required to file in order to vote in the November election. My prompt came, to be honest, from a phone call from a volunteer with Democrats Abroad here in New Zealand. As a citizen living overseas indefinitely, I only get to vote for Federal offices, and this year for me that means only President/Vice President and US Representative (there's no US Senate race in Illinois this year). I vote using the address I was last registered to vote in the US, the NW side of Chicago (Jan Schakowsky's district—YAY!!). So, to register, I went to the website of the Chicago Board of Election Commissioners and on to the page for Military/Overseas Voters. I downloaded the FPCA as a PDF from a link on that page, filled it in, printed it out and signed it. Then, I scanned the signed form and emailed it to the election officials. Today I received an email reply telling me that my email ballot will be sent by the end of the week. I’ll again print out the ballot, mark it, and mail it back to them. They also send a formal ballot by post, and if I send both back, only the formal ballot is counted. What I don’t get is how this differs from just sending the ballot by email, as they’ve done for many years (the first time I used that system was 2008). Maybe it’s just a way that doesn’t require email. I should know next week, when the service is due to go live. All of this is done in accordance with Uniformed and Overseas Citizens Absentee Voting Act (UOCAVA) and the Military and Overseas Voter Empowerment (MOVE) Act, which require that states must permit absent uniformed military voters and overseas civilian voters to use absentee registration procedures and to vote by absentee ballot in all elections that include one or more federal offices. However, there has been a change requiring that the FVCA must be filed for every federal election cycle—every two years—where before it would be could for four (in some states, longer). Not every jurisdiction makes it as easy as my old one does—in fact, some states seem to go out of their way to make it difficult for overseas citizens to vote. For many overseas voters, the best way to register to vote is to go to Vote From Abroad—it's from the Democratic Party, but they help everyone, regardless of affiliation. I know that there are some people who don't think I should be “allowed” to vote because I live overseas, and others who wonder why I'd bother. The answer to both is the same: Voting is my fundamental right as a US citizen, a right that relatives have fought (and some have died) to preserve and protect. To me, not voting dishonours all those who have fought to preserve our democratic rights, including relatives and strangers alike. While some people may not like HOW I vote, they have no right to tell me NOT to vote. There are some things that simply transcend politics. Deadlines for overseas Illinois voters: The registration deadlines for ordinary absentee voters (those overseas temporarily): Monday, October 8. The deadline for Illinois voters overseas indefinitely (federal office only ballot): Moday, October 29. Ballots must be postmarked by November 5 and must be received by the Commissioners in Chicago by Tuesday, November 20. I posted a less detailed version of this on Facebook. Today is the seventeenth anniversary of when I arrived in New Zealand as a tourist. It’s always been kind of lost among our special days, since we focused more on when I arrived in New Zealand to stay (November 2). However, tonight we were talking about it with our niece and it dawned on me—and this should have been obvious—today is the anniversary of the first time Nigel and I saw each other in real life. He met me at Auckland Airport, then, in the carpark, we found his car had a flat tyre, and we needed to change it before we left. I knew and remembered all that, of course, but it somehow got lost over the years (not the least, as I’ve remarked before, because today is September 11 in the USA, a date with significance all its own). 18 years ago, I could never have imagined I’d move to a country on the other side of the world to be with the man I love. Now, I can’t imagine life any other way. And it all began, really, 17 years ago today. We’re in an appliance breakdown period, it seems: Several different things have broken down in a relatively short period. It happens—in my opinion, more often than it should with things not built as well as they used to be. But I would say that—I’m in my 50s, and by now I should apparently be complaining that things aren’t built as well as they used to be. Be that as it may, it got me to thinking about how dependent we become on our technology, even after only a few years. Things didn’t exist, then they do, and then we can’t function without them, all before we’re even aware of it happening. Microwaves are like that for me—I can’t imagine getting by without one. For older people, it might be a washing machine, for younger people it might be a smart phone, but for all of us it’s about becoming so entwined with our technology that our daily lives almost depend on them. Cue dystopian melodrama. The reality is far from the fictional negative world: Something breaks, we repair or (more likely) replace it, and if necessary, we somehow manage to live without it for awhile. We humans are far more resilient than the authors of speculative fiction give us credit for. Anyway, all of this nice in theory, but it was sorely tested when our television blew up. I mean that more or less literally, in that there was a hugely loud BANG! and then the TV no longer worked. After some misfires, we finally arranged to have someone come to look at the TV to find out what was wrong. The man opened up the back and at that moment I realised that I’d never seen the guts of a plasma TV. 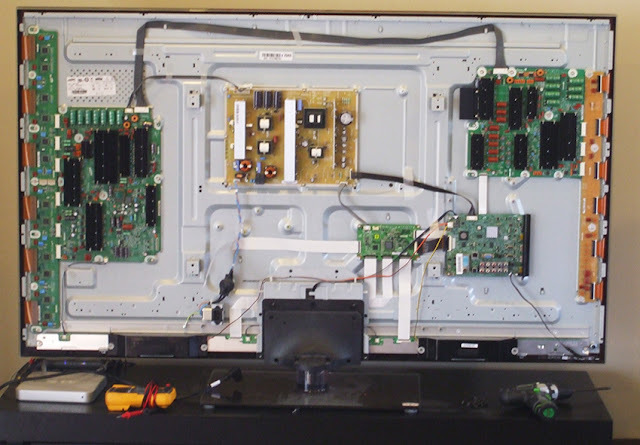 I also realised that until that moment it had also never occurred to me that I’d never seen the guts of a plasma TV. Maybe you haven’t, either: The photo above is the guts of our TV. Cross that off your bucket list. Meanwhile, the technician (who I kept thinking of as a “TV repairman”; how last century…) determined that, quite possibly, the large square circuit board on the left was blown, as was one of the two skinny ones on the left edge. They will attempt to replace them to see if it fixes the TV, and, if it doesn’t, it’s the plasma panel, which is another matter entirely (and they’d have to take it away to repair). The TV blew up a week ago Sunday. This was 11 weeks, 1 day, 23 hours and about ten minutes, give or take, since the first anniversary of when we bought it—and that long since our one-year manufacturer's warranty expired. However, in New Zealand we’re covered by the Consumer Guarantees Act, which, among other things, mandates that goods sold to consumers have to have a reasonable lifespan, and our TV has had FAR from that. So, ultimately, it will be up to the store to repair or replace, pursuant to the Act. This means that, in the end, all will be well—getting there is the painful part. We have a TV in the master bedroom, complete with pay-TV decoder, but we discovered that it no longer worked: We could watch only two channels. So, of course we upgraded the decoder (does anybody ever fix those?) and we have TV once again. But not being able to sit and watch TV in the evenings has been a real change in behaviour. Which brings me back to where I started: We are completely used to being able to watch TV whenever we want, and adjusting to the reality that we can’t has been a bit of challenge. As Joni sang, “don’t it always seem to go, that you don’t know what you got ‘til it’s gone…” Well, technology may not be paradise, but it sure makes life seem a little more like it sometimes. Right now, I just want my TV working again. On August 31, 2012 a long filament of solar material that had been hovering in the sun's atmosphere, the corona, erupted out into space at 4:36 p.m. EDT. 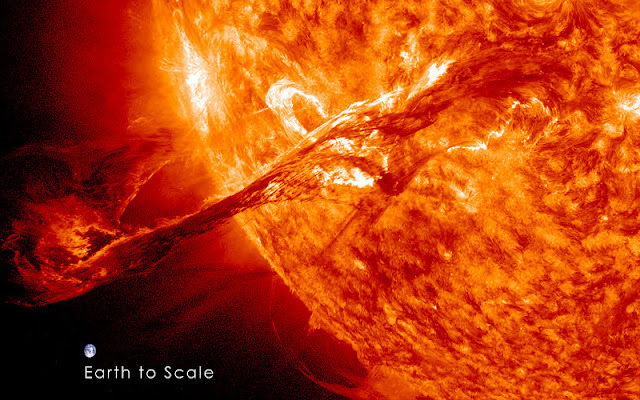 The coronal mass ejection, or CME, traveled at over 900 miles per second. The CME did not travel directly toward Earth, but did connect with Earth's magnetic environment, or magnetosphere, causing aurora to appear on the night of Monday, September 3. I added emphasis to the above just in case a casual reader misses it: This photo includes a tiny earth for the sake of comparison only. Still, the image made me think of the movie Knowing (which, despite its flaws, I kinda liked). In case you’re wondering (I was), 900 miles per second is approximately 1,448.4096 kilometres per second, or nearly the length of New Zealand (1600km) in one second. The distance between the earth and sun is about 150 million kilometres (93 million miles). At that speed, a CME would take about 28 hours to reach the earth (which is why the aurora weren’t visible until the night of September 3). Fortunately, they dissipate before they make it that far—well, so far, they do: December 2012? I’m kidding—I do NOT believe in any of that Mayan end-of-the-world stuff. The other reason I like this image (apart from its space-related awesomeness) is that it’s also kind of a visualisation of how I feel at the moment: Dwarfed by all that needs to be done, somewhat overwhelmed. But not so overwhelmed that I can’t stop to marvel at the wonders of the universe, and of science. Or, to post about it, obviously. There are far too many people who claim there’s no difference between the Democratic and Republican parties, one of which will control the presidency and one or both houses of the US Congress. Today, the Democratic National Convention proved that the difference is stark and dramatic. The Republican Convention looked nothing like America. For example, it was overwhelmingly white. Their party doesn’t keep statistics on the racial make up of the delegates, and that’s understandable: Various media estimates put the number of black delegates as between 22 and 28. Democrats, by contrast, had just under 1500. By contrast, Republicans want to amend the US Constitution to forever outlaw marriage equality in all 50 states. That’s one part of that party’s cruel platform that their Republican presidential and vice presidential nominees enthusiastically embrace and pledge to enact. 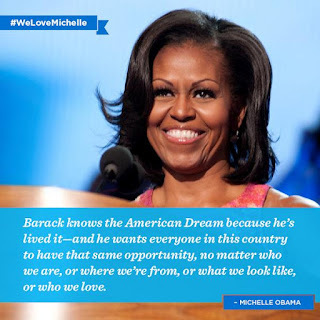 The Democratic Party platform also says “…the word ‘family’ in immigration includes LGBT relationships in order to protect bi-national families threatened with deportation.” That means families like mine: I live in New Zealand because the country of my birth and of my ancestors provided no way for the man I love to be with me, so I moved here because New Zealand valued our family. Republicans are hostile to our families and our relationships and many of their leaders have pledged to oppose the inclusion of LGBT families in immigration reform. Now, let’s look at the conventions. Speakers at the Republican convention continually spoke in terms of exclusion—presenting phony “family” values that clearly exclude LGBT people, sometimes openly. They present a narrow, restrictive view of what freedom means—clearly to them it’s just another marketing buzzword. In stark contrast, in the first 30 minutes of the Democratic Convention, there was an openly gay speaker—something that the Republicans never had and would never have permitted. Many speakers on the first day also specifically mentioned LGBT people as part of the American family—real family values, in other words, and real freedom. This continued right up through the speech of First Lady Michelle Obama (pictured with this post in a graphic posted by the Democratic Party). All of these are evidence of the clear difference between the two parties. I believe that America can—and must—do better for all its people. To me, it seems obvious that only the Democratic Party could actually achieve that. This is a short video made to demonstrate how far New Zealand has already come in enacting marriage equality. The video lays out the order in which things happened, starting with what is widely regarded as the catylyst for change in New Zealand: President Obama's endorsement of marriage equality. I like to remind people that passing the first reading is only the first step in what is still quite a long journey—it really is only the beginning. Still, no harm in pausing to reflect. Should religions be allowed to refuse to perform wedding ceremonies for couples they don’t approve of? Marriage is a government function, set in law, and government decides who can perform legal wedding ceremonies in accordance with the law, and what the rules for doing so are. As far as I’m aware, all Western governments that give religions the legal authority to perform wedding ceremonies under law also exempt them from having to perform such ceremonies for couples to which they have some sort of religious objection. Can’t get any clearer or more straightforward: NO person, whether religious clergy or other licensed marriage celebrant, is required to perform a wedding ceremony. End of discussion. Or, so it should be, but isn’t. For some reason, some self-described supporters of marriage equality say there must be a special amendment to make clear that no religion will be forced to perform a same-gender wedding ceremony. This bizarre notion exasperates me, no matter how well meaning the advocates may be. 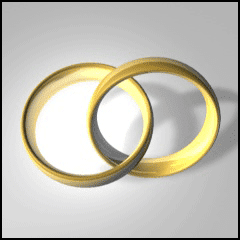 The law is clear that no celebrant, religious or otherwise, will be forced to perform a wedding for a same-gender couple. The Human Rights Commission—which handles complaints of discrimination—agrees, but some remain doubtful. This erroneous belief is based partly on an opinion offered by a barrister who represented an anti-abortion group. In answer to a query from New Zealand’s anti-equality group, he implied that that Human Rights Commission doesn’t know the law they work under, and argued that a minister who refused to perform a wedding ceremony for a same-gender couple would be in violation of the law. That’s nonsense. What is relevant here is that private religious spaces (like churches), as well as the religious services and ceremonies they perform are NOT covered by the Human Rights Act—only Section 29 of the Marriage Act applies. Some also might be confused about this because if a church rents out its community hall to members of the general public, it would be unlawful for them to refuse to rent that hall to same-gender couples because same-gender couples have the same right to be free from discrimination as everyone else has. This is in NO WAY the same thing as a church being “forced” to perform a wedding ceremony for a same-gender couple. Not even close—in fact, it doesn’t have anything to do with marriage! Here’s the first thing that annoys me about this argument: It’s incredibly stupid. Does anybody seriously think that a same-gender couple would want an anti-gay clergy person to perform their wedding ceremony? WHY? What on earth makes some people think that a same-gender couple would want their special day ruined? Out of spite? If that’s what they think it is, it says something about the person saying that. The second thing that annoys me—really annoys me—about this argument for a special amendment: It’d exempt religions from holding weddings specifically for same-gender couples. No one is asking for a special amendment so that, say, a Jewish person can be excluded from a wedding ceremony in a Christian church because everyone knows churches already have that right. As for example, Prime Minister John Key. So, clearly churches can easily refuse to marry couples they don’t approve of for whatever reason, yet we have to make that extra double-plus obvious ONLY for same-gender couples? Why, precisely? Why is it necessary to single out ONLY same-gender couples? There may be a person or two who thinks that such a special amendment is a strategy to blunt opposition. As if! The religious people who most demand such a special amendment would never support marriage equality, no matter what. Ever. Far better to explain as often as is necessary that Section 29 makes it clear that NO celebrant is required to perform any marriage. We don’t need a special amendment to exempt religious groups from performing wedding ceremonies specifically for same-gender couples because they already have the right to refuse, and especially because no same-gender couple would want an anti-gay religious officiant, anyway, so the whole argument is plain silly. But, then, the mixture of politics and religion often is. In this video, “The Gay Debate: The Bible and Homosexuality”, Matthew Vines speaks on the theological debate regarding the Bible and the role of gay Christians in the church. He delivered the presentation at College Hill United Methodist Church in Wichita, Kansas, on March 8, 2012, and uploaded to YouTube a couple days later. I only found it recently, through my travels on the Internet. Matthew began his search for answers about what Christian scriptures actually say about homosexuality, and in this presentation he outlines much of the counter argument to the rather strident apologists for fundamentalist Christianity. He does a very good, scholarly job. It may be a bit long for casual viewers, but for anyone with a keen interest in the subject, it’s well worth the time. He even provides a transcript of his presentation on his site. To me, one of the good things about being a preacher’s kid—of a father who was a preacher’s kid—is that I have a significantly better than average understanding of what’s in the bible (I used to teach it, after all). However, that’s also a curse: I know when and how much conservatives are misusing that same bible. As a non-theist, I would seem to have no personal stake in whether Christians better understand their own theology, but as a secular humanist and, particularly, as a person often victimised by fundamentalist preachers, I do wish more Christians took the time to learn what their theology is all about—and what it isn’t about. Matthew Vines’ presentation helps. But I have no illusions that the people who need it most will actually watch it. But if only a few do, learn, and resolve to be better and to do better, I think that’s an important start. And, we have to start somewhere. Colin Craig, the leader of the Conservative “Party”, is like that scorpion. He’s been trying to convince mainstream New Zealanders that he’s a reasonable conservative politician who leads a logical coalition partner for the ruling National Party. He couldn’t keep that act up, however, as his nature compels him to extremism. Up until recently, his biggest problem seemed to be the fact that despite spending part of his own fortune in the last election, he was unable to win an electorate seat, nor to convince enough voters to get him or anyone else from his “party” into Parliament. Nevertheless, for a time the newsmedia took him seriously, turning to him as the go-to religious conservative to comment on the possibility of a marriage equality bill in New Zealand. Unfortunately for him, that issue exposed his true nature. This should have been obvious from the beginning, given his tendency to regurgitate propaganda from the USA’s radical anti-gay industry, either without knowing, or perhaps not caring, that the propaganda was almost entirely based on lies, deliberate distortions and deception. It was those groups’ propensity to lie, distort, deceive and smear that got them labelled anti-gay hate groups. If Colin had really been the serious politician he claimed, and not a far-right religious/political ideologue, he should’ve been more careful in selecting arguments to parrot. But Colin’s poor judgement in regurgitating deeply flawed propaganda was only the start. Once the marriage equality bill was drawn, Colin flew into full frothing mode, declaring: “It is not intelligent to pretend that homosexual relationships are normal." The crushing irony of that attack is that he elsewhere declared that the debate is “…an issue of respect. Respect for the many stakeholders in what marriage means.” Respect for all except LGBT New Zealanders, obviously. And now, he’s ended all efforts to hide his anti-gay nature. He sent flyers to 20,000 households in the electorate of Prime Minster John Key, and in the letter accompanying it Colin gave prominence to a supposed comment from a supposed voter in the electorate: "Colin, you should stand here because John Key is too gay for Helensville." Call me old-fashioned, but I wouldn’t have thought that it was a good idea to attack the leader of the party you want to be in coalition with, a party without whose support you simply cannot get into Parliament. In case anybody doubted he intended to gay-bait the Prime Minister, Colin doubled-down: "There are people out there [in the electorate] who simply don't like to see their Prime Minister doing things like dancing on stage with transvestites, as he has done in the past," he said, referring to Key’s appearances at The Big Gay Out, New Zealand’s largest LGBT event. Nice to see Colin practicing what he preaches and showing all that respect to LGBT New Zealanders, eh? I have no idea why Colin is so obsessed with homosexuality, or why he feels the need to attack LGBT New Zealanders with outright falsehoods and fear-mongering. But we’ve seen all this before: Colin is acting just like Graham Caphill, also a far-right religious extremist who entered politics and pilloried gay people. Like Colin, he also used falsehoods and homophobic rhetoric. Like Colin, for a time Graham Caphill tried to present himself as a reasonable conservative who happened to be religious, and where is he now? Like Graham Caphill, Colin Craig can’t keep his nature hidden and, also like him, he will similarly fade from view as the entertainment value from having a raving nutter in the news ends. Colin has caused his own downfall simply from being unable to keep his true nature hidden. His real problem, then, is that, like the scorpion in the fable, he just can’t help himself.